Our ZC series, miniature, locking, multi-pole, shielded connectors are available in a range of 2 to 8 pole plugs and sockets. These are primarily intended for low voltage and signal applications. Contacts are tin plated and other metal parts are nickel plated brass or Mazac (zinc aluminium alloy). There are also 90° versions of the plug available to order. Specification: Rated 1A / Pin - 48V max. See the PDF data sheet: CliffCon® Miniature ZC Series Connectors (opens in a new window). All plugs rated 1A per pin. 48V maximum. 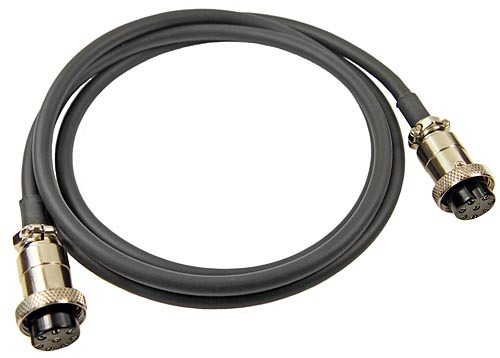 See the PDF data sheet: CliffCon® Miniature ZC Connector Cables (opens in a new window). CIH 684 214 4 pin 1.5m. Ø6.7 4 x 0.50mm² FR-PVC unscreened. CIH 684 216 6 pin 1.5m. Ø4.8 6 x 0.22mm² FR-PVC unscreened. CIH 684 218 8 pin 1.5m. Ø5.8 9 x 0.22mm² FR-PVC unscreened.